Traxco was found in 1991 as a company devoted to supplying original parts for every Pivot Irrigation system. We offer ongoing technical support and service for the manufacturing, maintenance and repair of center-Pivot and lateral move irrigation systems. Our specialist staff have extensive experience in troubleshooting and making modifications and conversions for mobile irrigation systems. Their aim is to help maintain all equipment in operation on a daily basis, and help to ensure the systems are always operational. We guarantee the availability and affordability of any Pivot Irrigation part or component, solving the needs of our customers and avoiding unwanted machine breakdowns. 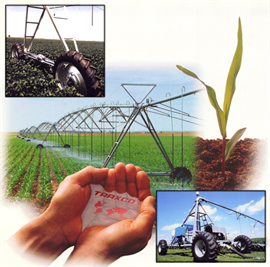 We also have innovative products for application in other irrigation systems, sprinkler irrigation, agricultural irrigation, agricultural equipment in general, as well as naval and industrial equipment. All our products are manufactured by companies originally supplying the leading Pivot System manufacturers. High quality components that improve machine performance, helping to reduce costs and increase production. We provide technical support and specialist advice to quickly and effectively resolve the various performance problems that may arise. Using computer technology, we design the best water application possible to provide continuous, high quality irrigation and high crop yields. Since our founding in 1991, direct contact with our customers is our business philosophy, by listening to their needs and providing advice about the latest technology in irrigation systems.